In today's increasingly competitive business environment, businesses with lower call volumes need the same level of communication efficiency as large corporations. The Stratagy Flash is a stand-alone, two- or four-port, solid-state voice processing system. 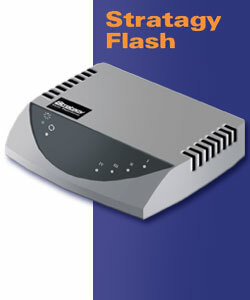 Stratagy Flash provides sophisticated features with only minimal investment and administrative support required. As a result, Stratagy Flash is the ideal voice processing solution for small businesses with fewer users and relatively low call volumes. The system’s CompactFlash® memory provides high data integrity and consistency, and the compact unit can be easily installed on a table or wall. Toshiba Stratagy Flash voice mail delivers the cost-effective solution, providing the crucial benefits of powerful voice processing -- without requiring the major investment involved with a complex system. This feature answers incoming calls, enabling employees to focus on their main job responsibilities. Automated Attendant streamlines operational efficiency by allowing callers to route their own calls and leave messages without receptionist assistance. The caller simply enters the mailbox number of the person they’re calling, and the call is handled based on that person’s specific mailbox configurations – from dialing another extension to screening the call to executing an IVR application. These capabilities make your telephone system work harder for you. When a caller enters the specific extension or department they want, the call is automatically routed. Callers can easily find a person’s extension by using the company directory feature. If an extension is unanswered or busy, the call can be automatically routed to another extension or an operator. If all called extensions are unavailable, callers can hold, hang up, or leave a message. The system also detects fax tones and transfers those calls to a fax machine. Automated routing enables your staff to focus on tasks other than directing calls. When an employee is unavailable or busy, Stratagy can take messages. Each employee can record up to seven personal greetings for his/her mailbox, with specific greetings scheduled to play at various times of the day. This ensures that callers hear accurate information 24 hours a day, 7 days a week. When extensions are busy or do not answer, Stratagy automatically plays the appropriate greeting. The caller is offered the choice of leaving a message, calling another extension, holding, or being transferred to an operator for assistance. Stratagy IVP8 users can manage voice messages with ease. You have total control over your messaging by simply pressing specific telephone keys. The Stratagy system saves time by letting you replay, skip forward or backward within a message, delete, pause, control playback speed and volume, play messages in order of priority, and much more. You can also share information by forwarding a message to other Stratagy users, and attach your own voice comments. You can even customize they way you’re notified of messages, from receiving a pager alert to indicating urgent status. Plus, you’ll maximize efficiency by creating folders for different types of messages. During a call, you can record the conversation into your voice mailbox using the Toshiba Strata CTX business telephone system. This feature is ideal for keeping a record of important phone calls for future reference, and for capturing detailed information you may need to assure accuracy in correspondence, reports, etc. Starting and stopping a recording is as easy as pressing one key. Convenient pause and restart features enable you to review details of the conversation at your own pace.